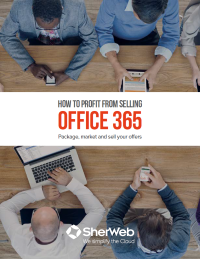 Read this guide to find out how you can improve your cloud-business, and get clients to take note of the advantages of integrating Office 365 into their operations. In this day and age, selling cloud-solutions to businesses is a smart investment, since it is the prefered management system implemented by organizations across the globe. But how can you optimize your selling techniques and diversify what you’re offering to make more money? Managed Service Providers can do right by SMBs by teaching them the benefits and opportunities that come with moving to a cloud-based platform like Office 365.